BIN’s 100% CHXN™ is a real chicken dietary supplement. 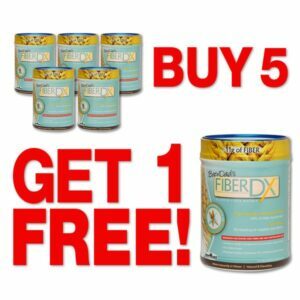 America’s first choice for a complete Chicken Protein Isolate now in a Unflavored* convenient powdered ingredient delivering the highest bio-available Protein in a Patent Pending (GP) gently processed isolate that is Gluten, Lactose and Allergen Free. 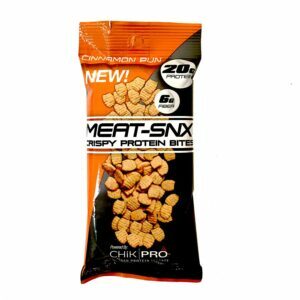 BIN’s 100% CHXN™ packs 21 grams of the highest quality, digestible, muscle-building protein per serving with less than 2% collagen. It’s loaded with BCAA’s and all the essential and non essential amino acids needed to support muscle recovery and growth. This superior dietary supplement chicken-protein technology yields some of the highest levels of muscle-building amino acids and contains more than 180% more naturally occurring L-Arginine than Whey (1.46g of naturally occurring L-Arginine per serving). 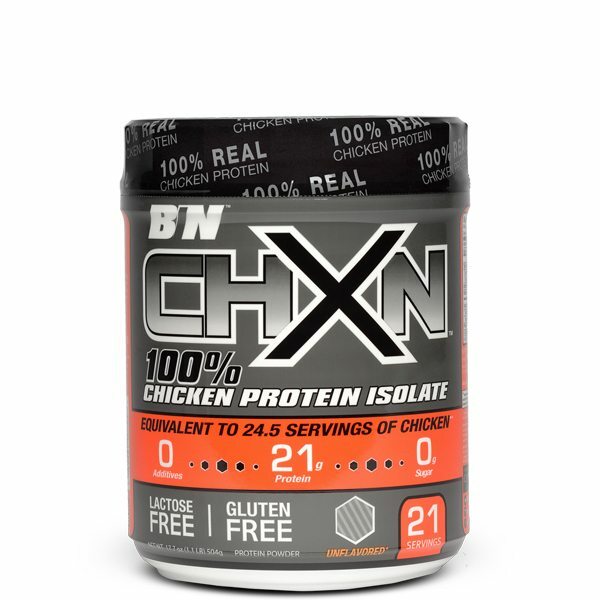 BIN’s 100% CHXN™ is the New Gold Standard for a Real Chicken Protein Isolate Powder when a Higher REAL FOOD PROTEIN DIETARY SUPPLEMENT is wanted. BIN’s 100% CHXN™ Isolate can be added to your favorite beverage, food, recipe, or can be used alone allowing active adults to reach and maintain peak performance. Chicken is the most common type of poultry in the world. It has been domesticated and consumed as food for thousands of years. According to the USDA, 100 g. of chicken has energy (215 kcal), protein (18 g), fat (15 g), saturated fat (4 g), cholesterol (75 mg), calcium (11 mg), iron (0.9 mg), magnesium (20 mg), phosphorous (147 mg), potassium (189 mg), sodium (70 mg), and zinc (1.3 mg). It also contains Vit. C, thiamin, riboflavin, niacin, Vit. B-6, folate, Vit. B-12, Vit. A, Vit. E, Vit. D and Vit. K.
High Protein Content: Chicken is one of the highest protein sources typically found in people’s diets; 18 g per 100 g of chicken. Protein is made of amino acids which are the building blocks of muscle. The recommended daily protein requirements is 1 gram per 1 kg of body weight, or 0.4 g of protein per pound of body weight for average individuals. 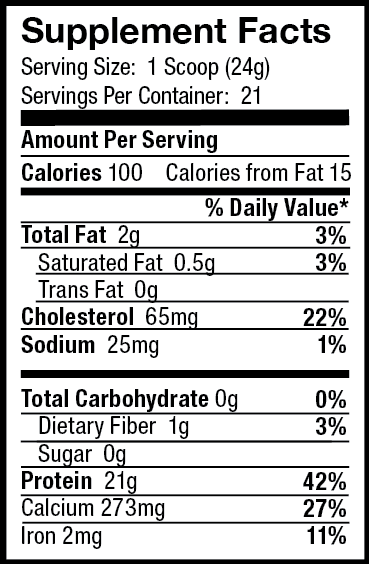 For athletes, the daily requirement of protein is higher at about 0.6 g to 0.9 g per pound. Important Source of Vitamins and Minerals: Chicken is a very good source of vitamins and minerals, necessary for numerous activities in our body. For example, B vitamins are useful in preventing cataracts and skin disorders, boosting immunity, eliminating weakness, regulating digestion, and improving the nervous system, as well as preventing migraine, heart disorders, grey hair, high cholesterol, and diabetes. Vitamin D helps in calcium absorption and bone strengthening. Vitamin A helps in building up eye sight and minerals such as iron are helpful in hemoglobin formation, muscle activity, and eliminating anemia. Potassium and sodium are electrolytes, phosphorous is helpful in tackling weakness, bone health, brain function, dental care, and metabolic issues. Weight Loss: Diets with high levels of protein have been shown to be effective in reducing weight and studies have shown that significant weight control was observed in those people who regularly eat chicken. Reduced Cancer Risk: Studies have found that in non-vegetarians, a higher consumption of red meat, pork/ ham increased the risk of colorectal cancer, while, the risk of developing colorectal cancer in later life was reduced in chicken and fish eaters. Although studies suggest that eating chicken puts one at a lower risk than eating red meat, the evidence is not conclusive. Reduced Risk of Cholesterol Accumulation: The amount of saturated fat and cholesterol found in red meat such as beef, pork, and lamb is much higher than the levels found in chicken, fish, and vegetables. Therefore, the American Heart Association has advised consuming chicken or fish instead of red meat for a lowered risk of cholesterol and subsequent heart disease development. Rosemary extract as a natural preservative. Add 1 or more scoops of BINTM 100% CHXN™TM to your favorite beverage, recipe or 6-8 oz water. 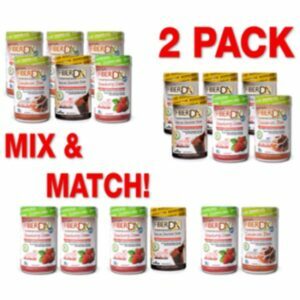 Use 1 or 2 scoops per day, or more as determined by your total desired protein intake per day. BINTM 100% CHXN™TM mixes instantly in a glass, shaker bottle or bowl. CHiKPRO™ is a patent-pending technology. 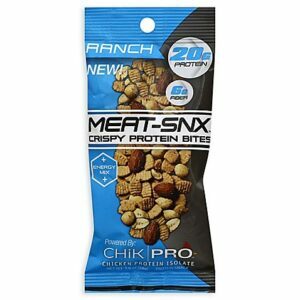 Add CHiKPRO™ to recipes, snacks, smoothies, ready meals, and more, for all the benefits of bodybuilders’ most trusted protein—without all the grilling, baking, and broiling. WARNING: Not for use by infants, children or pregnant or nursing women. Keep out of reach of children. For adult use only. Use only as directed. Do not purchase if seal is broken. Protect from HEAT, LIGHT & MOISTURE.